We have designed this lovely Christmas collection for you to learn new skills including how to model figures and animals with sugarpaste Using a variety of equipment and techinques. Father Christmas and his present list. A Christmas Tree and presents. A Snowman with a little pile of snowballs. A cute penguin and his Igloo. This class runs from 10.15 – 17.00 and will take place at Puddle Duck Bakery H/Q in Burford, Oxfordshire. All class equipment is included but please do bring an apron with you. Refreshments and a light lunch are also included. This class is suitable for beginners but experience working with sugarpaste would be an advantageous. Please see our “Book a Class” page for course dates and online booking. Our garden party collection is for those of you who want to take your cupcakes to the next level. This class really enables your cupcakes to stand out from the crowd! You will learn how to make delicate “life like” flowers using florist paste, and learn how to work with florist paste so you can achieve the best results so that your cupcakes really do have that WOW factor. How to make a variety of different flowers using cutters and different techniques. How to make the smaller minature rose, which is so useful, either for cupcakes or larger cakes. How to colour your florist paste to match your designs and flowers. How to pipe grass, great for garden designs! How to make a beautiful large “life like” Rose. How to use lustre dusts to give depth to your flowers. How to make daisy’s, cherry blossom’s, gerberas, open roses, miniture daffodils and many more flowers. How to perfect covering cupcakes with sugarpaste and achieving a neat, even finish. This class is all about decoration so you get to adorn 12 “naked” cupcakes (that we baked freshly for you that day) to take home and show all your friends and family. You will be amazed how much you can learn in one day. 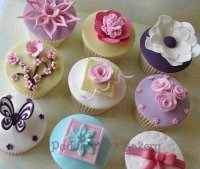 This is a great follow on class if you have done our “New to Cupcakes” workshop.